Who Owns What in the Organic food industry and here is some proof of the Illuminati working hard to make sure small business owners don’t ever overthrow their organizations. Oh what money and power can do. See how they just buy all these new companies? Most introductions of organic versions of well-known brands occurred after the USDA standard was implemented in October, 2002. Some, such as Dove Organic, have been developed for a specific corporation. Most acquisitions of organic processors occurred between December 1997, when the draft USDA standard was released, and its implementation in October 2002. Few companies identify these ownership ties on product labels. The fact is, organic food has become a wildly lucrative business for Big Food and a premium-price-means-premium-profit section of the grocery store. The industry’s image – contented cows grazing on the green hills of family-owned farms – is mostly pure fantasy. Or rather, pure marketing. 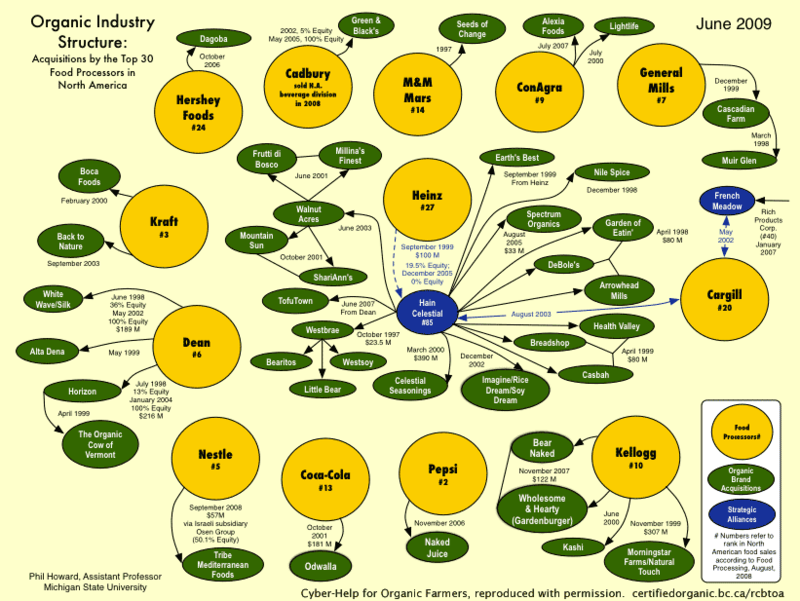 Big Food, it turns out, has spawned what might be called Big Organic. The Future of Organic Products: Brands or Private Labels? Pioneering brands are re-inventing themselves to widen consumer appeal. However, retailer private labels are also evolving with some transcending traditional boundaries. The O Organics private label has expanded from Safeway retailers into foodservice outlets in the U.S. It has also developed an international presence, marketed by numerous food retailers in Latin America, Asia and Africa. Whole Foods ‘Organics’ From China! Whole Foods, which touts its support for locally grown food and organic agriculture, imports a great deal of its frozen food from China. It is a fairly familiar story in business. Someone has an idea, a passion. He or she builds a spectacular small business around that idea, builds a reputation for creating something really unique, and people love the business. Then, the owner sells the company to a large corporation. 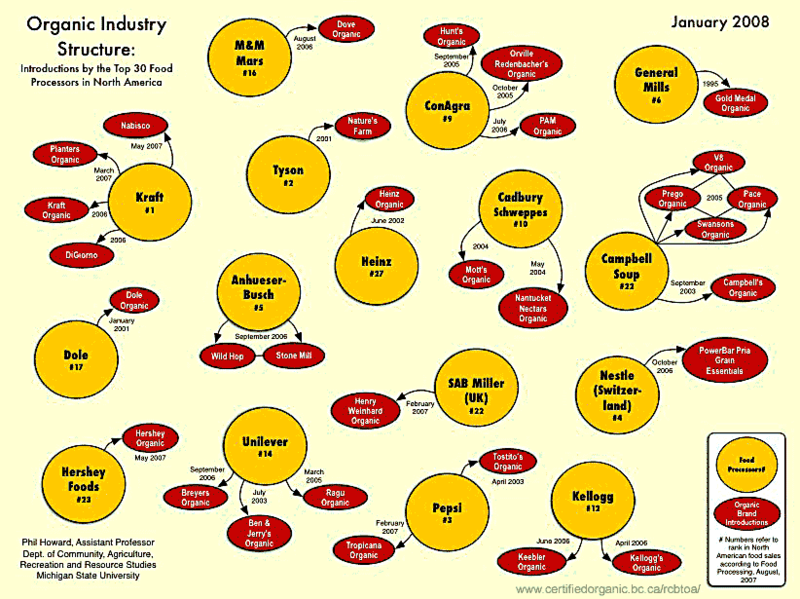 Who’s Really Behind Organic Food Brands Like Amy’s and Odwalla? Over the past decade many small organic food brands have been snapped up by giant corporations. Clearly, this can be bad for standards and quality. AP, Miami Herad – May 23, 2013. In an interview, CEO Denise Morrison said Campbell planned to keep Plum as a distinct brand. For example, the packaging will not be changed to reflect the new ownership. 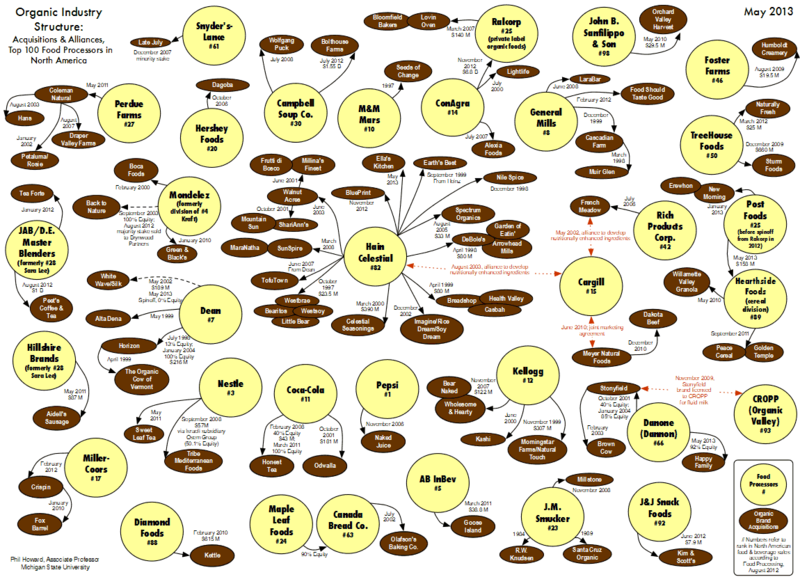 Big Food, it turns out, has spawned what might be called Big Organic. Even as the demand for organic food continues to explode, organic farmers in America are getting thrown under the very beet cart they helped build. Samuel Fromartz, Huffington Post – July 7, 2009. Is Organic in an End-Game? In short, though some are controversial, you would be hard-pressed to find any processed organic food business arguing for a blanket dismissal of all synthetics. The Cornucopia Institute – October 13, 2008. They claim the acquisition of major brands by corporate agribusiness, and their dependence on factory farms, threatens to force families off the land and deprive consumers of the superior nutritional food they think they are paying for. The Question: How do I decide where to buy? Responsible Shopper – provides a track record for major companies.